Dedicated to performing the music of the Jewish People from around the world. Directed by guitarist, vocalist, and arranger Achi Ben Shalom, Adama has brought the full-spectrum on Jewish music to the San Francisco area. In addition to interpreting traditional klezmer, Ladino, Yiddish, and Hassidic music, the group has incorporated a wide range of contemporary tunes written by Jewish-Americans. While they perform most shows as a quintet, Adama can perform as a trio and duo. Adama plays music before, during and after the ceremony, during the reception and throughout the event. Emcee and DJ’d music are available and included. Our repertoire includes a variety of styles such as Israeli, Klezmer, Hassidic and Mizrachi, performing songs in Hebrew, Yiddish, Ladino and English. 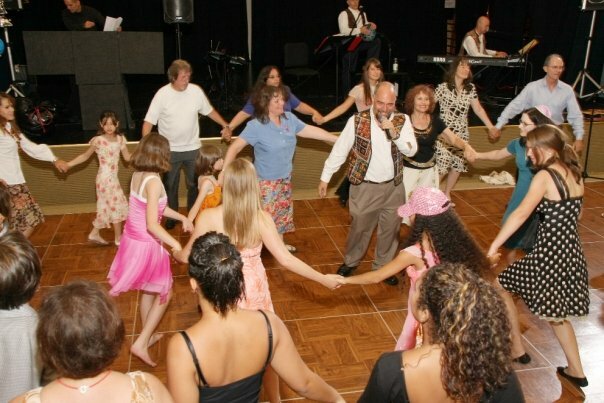 Entertaining in the Bay Area for over 20 years, our audiences include all age groups and denominations. 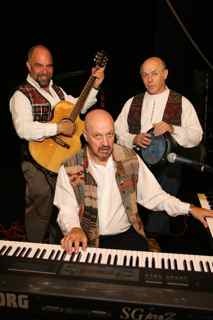 Our musical program is designed to compliment all segments of your event. We provide music for room ambience, music for ceremonies, music for high energy dancing and singing, concerts and street fairs. Let me personally thank you, Achi, and your bandmates Michael and Jan for sharing your wonderful talents at Temple Beth El, Aptos, last Sunday. I am glad so many people got to enjoy your outdoor stage performance. The spontaneous folk dancing element surprised and delighted me and I'm sure everyone else there! I only wished I could have done more than a couple of the dances, but I was too tired!! I do wish we could have arranged for more kids at your family program, but whoever was there got a full treat. And I looked in on the dance session and that looked wonderful. I love how Michael went around the circle accompanying the dancers on his clarinet. A lot of fun for sure. So it was just great working with you, Achi, and hope we will be able to do this again sometime soon. I am sure we will be presenting another cultural fair next year. All the best and here's to more beautiful music! 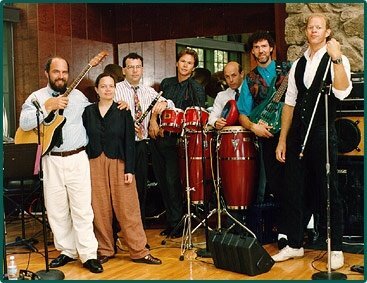 The Shtetlblasters is a multi-faceted musical ensemble that specializes in weddings, B’nai Mitzvah, and special events. The group’s repertoire spans many styles and generations. The band is equally at home playing high-energy traditional Israeli folk dance music, soulful R&B dance hits, and big band tunes from the Glenn Miller/Duke Ellington era! The Shtetlblasters was founded in 1992 by pianist Michael Gill and is comprised of talented musicians from around the San Francisco Bay Area. The word Shtetlblasters is a play on the word “ghettoblaster”, a slang term for a portable tape player or “boombox.” The Shtetl is the word for the Eastern European Jewish villages where so much of our soulful music, including Klezmer, originated in centuries past.